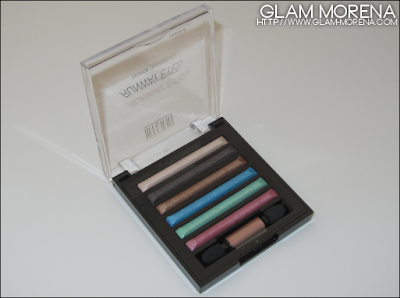 Glam Morena: Milani Runway Eyes Fashion Shadows. Milani Runway Eyes Fashion Shadows. I still have more Milani 2012 products to post about. 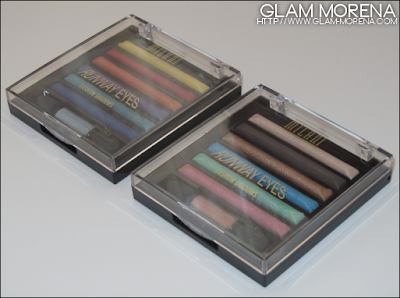 Milani released two new shades of their Milani Runway Eyes Fashion Shadows. This is actually my first time trying these particular palettes out. 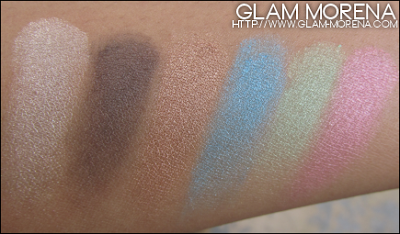 The pigmentation is pretty good, which you will see below in the swatches. You can apply them dry or you can apply them wet for more intensity. All of the eyeshadows are pearl and shimmer finishes. The packaging probably isn't the most ideal. You have to be extra careful with how you store or handle these palettes. 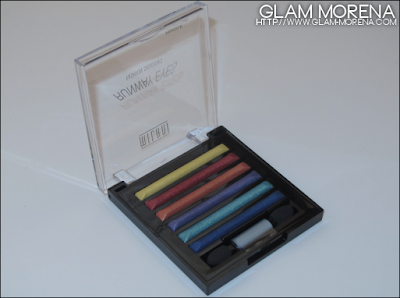 Description: Six intense eye color bars in one luxury compact with a double ended sponge applicator. Use individually or combine the colors for a multidimensional impact. Each collection has been expertly matched and designed to use the lighter tones to highlight, the medium and dark tones to contour. This luxurious formula glides on effortlessly. Use WET for more color impact or DRY for a shimmer effect. 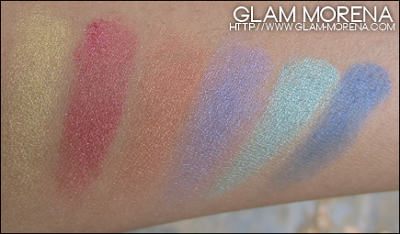 Here are swatches of both 2012 Milani Runway Eyes Fashion Shadows! 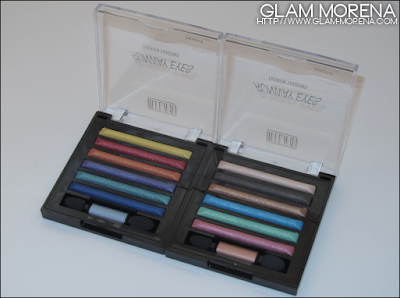 Have you tried the Milani Runway Eyes Fashion Shadows before? Thoughts? eu quero muito! Que sonho!!! I'm brazilian and I loved your blog. Love the colours - but have to admit that the design of where the shadows go is a bit odd. I'd always be worried about accidentally touching the other colours with my brush. I've had some milani quads before, they were a total fail for me. they were too chalky and not all that pigmented. however, these might be much better, i might try. I actually don't like these Fashion Shadows at all. The shadows crease and they're chalky, the color pay off (at least in in Ready to Wear) is poor, and they're not very blendable either. I've had these eyeshadows before, and you're right about having to be EXTRA careful about the packaging. The pallet is NOT ideal because the eyeshadows BREAK if you take it with you in a purse. Even the lady I was purchasing them from warned me, but I still took a chance and bought them anyway. The pigmentation is good, but I just wished they packaged it better so the shadows didn't become powder and mix together!